This entry was posted on April 5, 2018 by Logs Direct. The only thing better than pizza is a wood fired pizza- a hint of smoky flavouring that gives it that authentic taste. To do this, your pizza oven needs the right wood. Since the quality of the pizza lies on the quality of the fire, Logs Direct will provide you with the best logs perfect for this purpose. With our Softwood logs you can have a quick lit, hot fire to efficiently and easily get the oven going and quickly achieve a hot oven. The Hardwood logs provide a steady and long-lasting burn time. Both our Hardwood logs and Softwood logs have individual advantages for a pizza oven, and those in the restaurant market who like to add a little wood-smoke to their food. Each will create a brilliant fire for your pizza ovens, to create the authentic and rustic wood-smoked aroma. Or for the more discerning pizza lovers in the market we have our very own Italian beech compacted briquettes, the “Piccante;” these are being used by chefs all over the UK in the quest to have the best and most economical fire with the greatest taste. 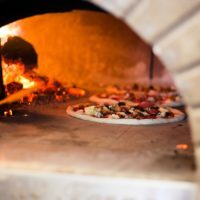 A pizza is always tastier when cooked in a wood burning pizza oven, so we will provide you with the largest selection of logs specifically created for wood cooking, so that you can make the perfect fire and therefore, pizza. For a faultless fire in your pizza oven or wood cooking appliance why not chose from our full range of logs for the greatest experience, a smooth and long-lasting fire? If you would like to discuss further why not give us a call and we would be happy to discuss with you your individual requirements. Get in touch to find out what you need to make your perfect pizza!